Nintendo’s Mario will be bringing joy to travelers this holiday season with the addition of the Nintendo Wii u Gaming Lounges in six popular U.S. airports. Nintendo is teaming up with Southwest Airlines to help making traveling easier for younger guests with the addition of these new multimedia Nintendo Gaming lounges. Dallas Love Field will be the first to open their Nintendo Gaming Lounge today, November 25th. 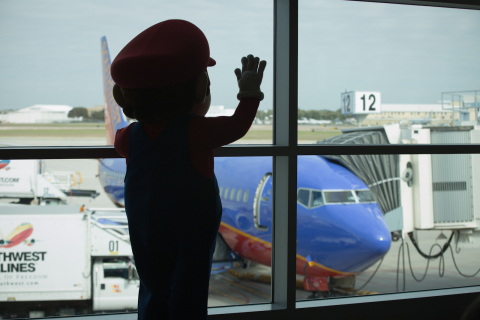 Mario will be at the airport this morning to surprise one Southwest Airlines flight with a special surprise this morning. 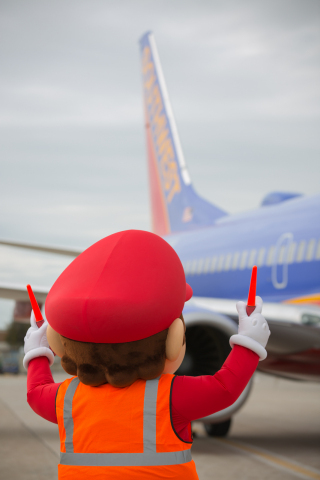 If you are traveling with your children on Southwest Airlines into Dallas Love Field this morning, keep an eye out for Mario! Guests will enjoy playing the most popular Nintendo games including Super Mario 3D World. The Nintendo Gaming Lounge will be in six different airports throughout the holiday season including Dallas Love Field, Atlanta, Denver, Chicago (midway), St. Louis and Tampa. Enjoy having the easy of holiday travel at one of this six airports this holiday season thanks to Nintendo, Mario and Southwest Airlines. Photos courtesy of Nintendo America.